Discussion in 'Workshop Framework (BUG Reporting Area)' started by Cranky Cat, Dec 23, 2018. I've had a couple of settlements with a shelter happiness of 3 out of 10. If I run the shelter fix nothing happens that I can spot. I've done this before 108 when it worked but I don't know for certain when it stopped since I wasn't paying close attention. I updated to the UFO4P and WF 1.08a but that didn't help. I tried disabling the shelter mechanic and it didn't seem to change anything. Is that supposed to update the report values or just make the shelter value get ignored? Edit: Nevermind, I saved with the disable shelter mechanic set and after I quit and reloaded it seemed to work. Actually, I'm still having issues with it and happiness in general. Despite having all their needs met the Coastal Cottage has 19% happiness. I have the shelter mechanic disabled but it still isn't a 10/10. The Shelter Fix may actually lower the value. Also, a couple of settlements have a frowney-face icon to the right of the happiness meter regardless of what the happiness value is. How do you disable the shelter mechanic? The option in SS is for enabling/disabling the automatic shelter fix. It does not disable the shelter mechanic, which is a vanilla mechanic. The sad smiley at the bottom of the ui means your happiness is too low for the next city upgrade(70,80,90 for tiers). The shelter mechanic flag is under the Workshop Framework options. I wonder how often the evaluation for the upgrade status is made since it doesn't go away. I have one at 80% and it's still at level 0 and has a frowny. 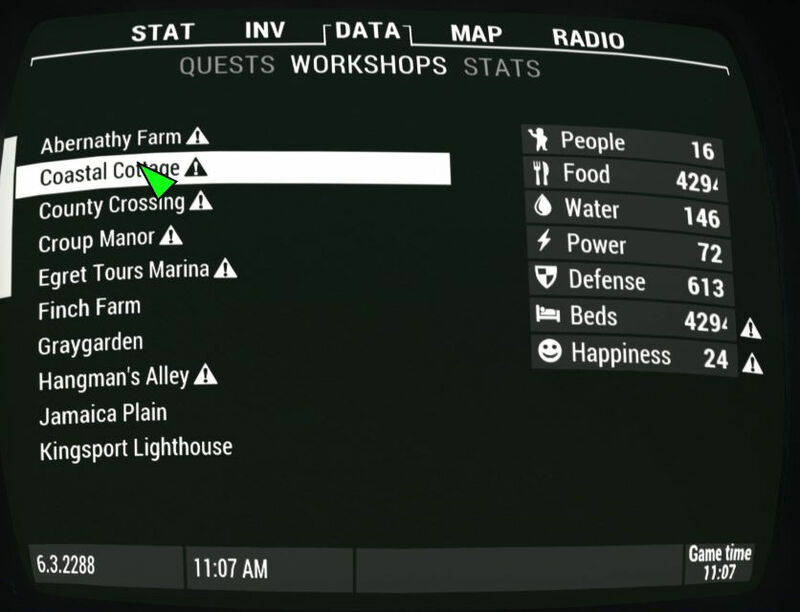 If I don't visit constantly my workshop data stats go wonky and happiness drops though.It's the same number at multiple settlements too, 4294 beds and food. This is after I made sure they had enough food, water, beds, and defense. I believe a change made by the Unofficial Fallout Patch workshop script causes evaluations to only happen once a day instead of every visit. Settlements won't update or build the next city level until that happens. I still don't know why my food and beds were 4294 in a couple of settlements though. That probably screwed up the calculations. Cranky Cat, do the settlements where you have the counts of 4294 have a mix of SS plots and non-SS items? For me I have 3 settlements with a mix of beds and exterior residential plots and when a plot upgrades the stats show 4294 beds. 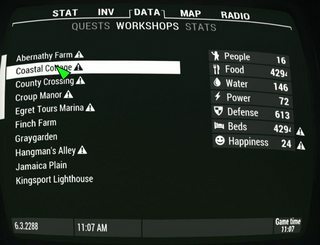 I have since found that the 4294 issue is the pipboy equivalent of the 999 bug in the Workshop HUD. Closing this ticket since you mentioned you had the shelter stuff worked out after a save and reload.